When the husband and I moved in to our house we knew we would have to do some work to make it more our style. 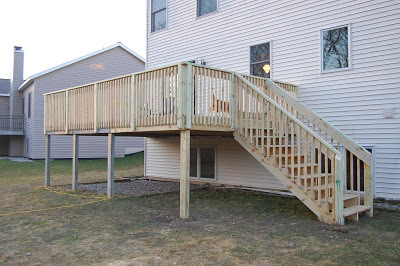 One of the items on our list was a new deck. 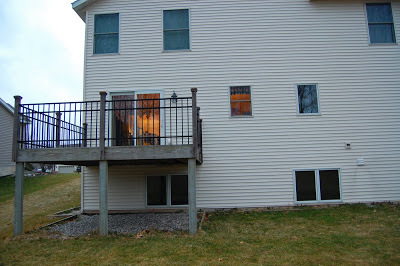 Here is what our deck looked like. Small, and no stairs! Such a pain, especially when you have a dog. 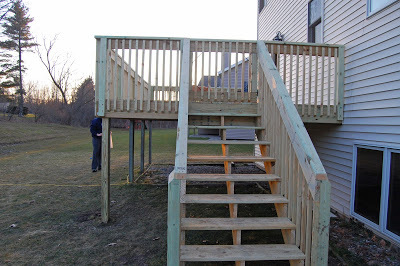 We decided this winter that when spring came around we would look in to adding stairs. 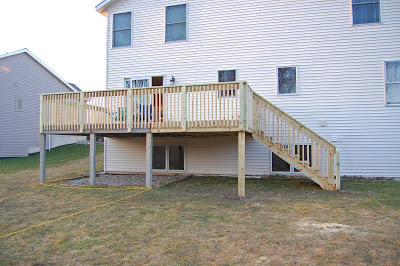 We wanted to shop around and get a few quotes now, figuring the deck companies might have some good deals since not many people do construction during the winter. We had a guy come out last Saturday and give us a quote….and we really liked him. (And we liked his price too). So we just went with it. 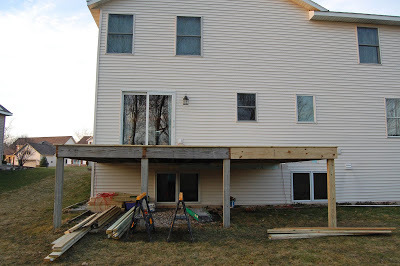 This was our deck the following Tuesday (last week). 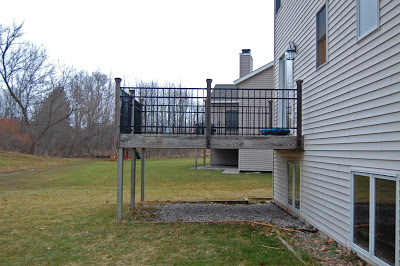 We decided to expand it out 8 feet and add new railing and stairs. And here is our deck on Wednesday! Yep, it only took them 2 days! Score. We couldn’t believe it! It is amazing how much bigger it looks….and we only added 8 feet. I had them add a little gate to the stairs too. I love the gate. It keeps certain orange kitties from escaping! 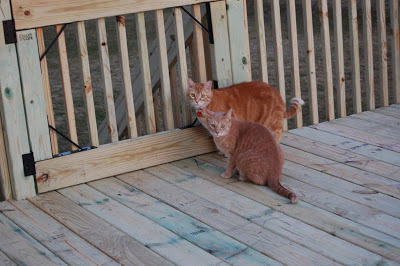 I also had them decrease the spacing between each post so that the boys couldn’t squeeze through and jump to the ground. 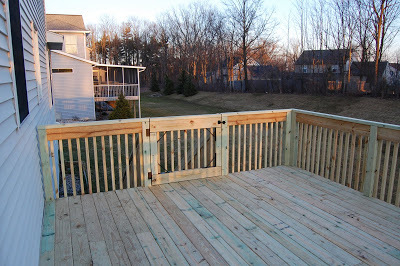 The deck guy thought I was crazy…but it worked! Henry does jump up on the ledge, so I still need to keep an eye on him, but it is way easier than before. And Wrigley loves the new deck too. We couldn’t be happier with how it turned out! 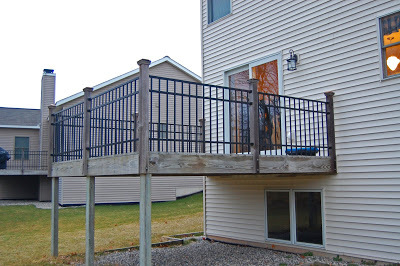 We want to paint and or stain the deck, but we have to wait until the end of summer. I can’t decided if we should stain it all one color or just stain the floor and paint the railing white. What do you think? On the second (and final!) day of construction the deck guys managed to blow out our electrical outlets in the front and back yard. They went into the basement to somehow get them going again (sorry, can you tell I have no idea what I’m talking about here? )…and they couldn’t. So they had to borrow power from our neighbor (which I still don’t understand, because we still had power in our house…but whatever). So the next day I discovered that half of the electrical plugs in the kitchen were also not working. So the husband left a message with an electrician. Luckily, the husband also got on the phone with his friend Joel from work….Joel told him to push the restart buttons to get the plugs in the kitchen to work…and he was right! We totally forgot about that. After that worked Joel had Jon scout out where the restart button would be for the outlets outside….and he found it on a plug in the garage….and it worked! That totally saved us a costly visit from the electrician. So Joel is our new go-to fix-it guy…thanks Joel! i LOVE the new deck. such an upgrade, it looks perfect! Great improvement! I'm sure the boys will enjoy the time outside. Consider just using stain….even if you want it white, there are all colors of stain and the up keep is less than for painted surfaces. I've been waiting for this blog. I knew I would love it and I do. I agree with your mom about staining is less upkeep. The gate at the stairs was a genius idea. love the new deck! The old one DEFINITELY doesn't work for animals!! The deck is gorgeous!!!! It does look a ton bigger. I like the white on the fence idea, but what is easier up keep?